While it’s been more than a decade since I’ve watched wrestling, I have enough memories of it from my youth and as a teenager in the nineties, that several of the characters still stand out in my minds eye. Pro wrestling if nothing else has always been about showmanship, in some cases to ridiculous and over the top extremes. Rikishi is good friends with the team here at Nerdbot, and for Halloween let’s examine a few of the best, worst, and weirdest of his brotherhood. If I’ve missed or left anyone off the list, bear in mind these are to the best of my recollection, and once again I haven’t watched for quite some time. My legal sense is tingling. When I was six I went out as Superman for Halloween. Luckily for me, DC wasn’t likely to sue me, mainly because I was a six-year-old kid in rural Nova Scotia. World Championship Wrestling and veteran wrestler Brad Armstrong weren’t quite so lucky when Marvel came knocking. Armstrong was one of those guys that can have a good match with just about anyone, but he also got saddled with a lot of ridiculous gimmicks throughout his career, and Arachnaman may have been the worst. WCW thought they were slick, naming him Arachnaman and putting him in a purple and yellow costume like he was one of those knockoff toys you’d see at the 99-cent store, but Marvel caught on and quickly trapped them in a web of cease and desist. By 2006 I really wasn’t watching wrestling very much if at all, but occasionally I’d catch Raw or Smackdown and that’s when I saw, what I assumed was a fever dream on my part. 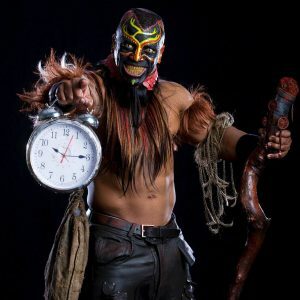 The Boogeyman would come slinking out on his hands and knees face concealed by a mask of paint, he would then smash a clock over his head, and move or dance in convulsions toward the ring. After his victories, he’d place live worms in his mouth and deposit them onto his adversary’s face like a mother bird feeding her young. The Boogeyman wasn’t around very long, and I still wonder if it wasn’t all just a weird fever dream from the start. 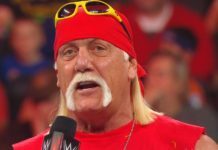 For weeks leading up to WCW’s Halloween Havoc PPV in the fall of 1995, there was a block of “ice” off to the side of the entrance on the way to the ring with promises of a Yeti poised to end Hulkamania. During Halloween Havoc, The Giant better known these days as The Big Show was challenging Hulk Hogan for the World title. At the end of their match, The Giant had Hogan in a bear hug when THE YETAYYY!!! 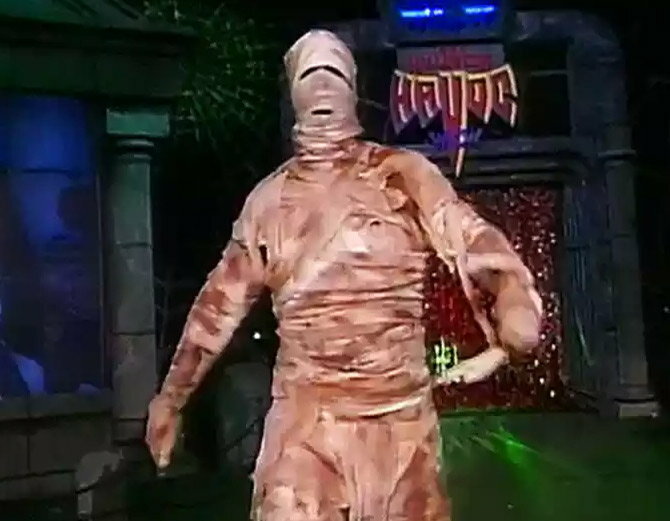 (according to announcer Tony Schiavone) walked out to the ring…except the Yeti was a mummy?! Standing well over 7 feet tall, Yeti entered the ring, bear hugged Hogan from behind (while The Giant had him from the front), and began to gyrate his hips. Something was running wild that night, but I don’t think it was Hulkamania. 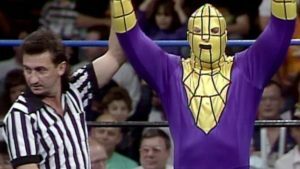 Staying in the year 1995, Vince McMahon and the WWE were no strangers to weird, nonsensical characters and on one of their syndicated shows, Phantasio made his debut. Face painted to resemble a mime, he would perform various run of the mill magic tricks before the match, saving his “best” for last with his finishing move being the removal of his opponent’s underwear through their tights, which I like to call the Abe Simpson. Phantasio would perform his greatest magic trick and disappear shortly after. Charles Wright is a cheerful, fun loving guy with a love of beautiful women and a few buds every now and then, if you know what I mean. So, his character of The Godfather made perfect sense and fit his outgoing personality like a glove. 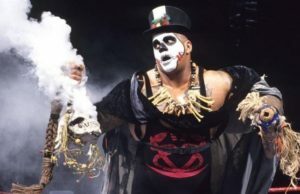 What didn’t quite fit was in the early nineties when he played the voodoo priest Papa Shango. It was a pretty cool and spooky looking character with a skull painted on his face, along with a top hat and a smoking staff. But, he never quite caught on and is best remembered for using his “voodoo” to make The Ultimate Warrior vomit all over a team of paramedics on national television like Lois Griffin had just offered him some chowder. Glenn Jacobs has had a long and storied career spanning two decades as the Big Red Machine Kane. He started as the horrifically burned little brother of The Undertaker and was covered mostly head to toe, face shrouded in a mask and couldn’t speak. Then he wound up being unmasked and remasked several times, was accused of making it with a corpse, has tried his hand at everything from breakdancing to beat boxing while Daniel Bryan rapped, and is now the Mayor of Knox County Tennessee. 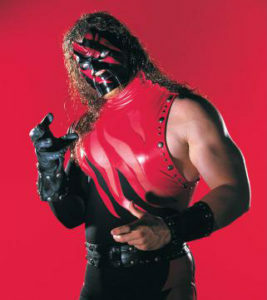 Through hellfire and brimstone, Kane promises not to raise your taxes. Mick Foley is a highly intelligent, articulate man. He can also be extremely glib, outgoing and is an amazing storyteller with several New York Times best selling novels to his name. 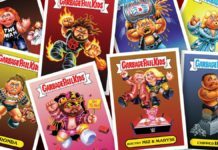 But, before morphing into the lovable goofball with Mr. Socko at his side his character of Mankind was a deformed, boiler room inhabiting psychopath missing part of an ear who would emit inhuman shrieks and pull his own hair out during his matches. Much like James Earl Jones is known to be a big teddy bear and had to dig deep within himself to find the evil that was Thulsa Doom or Darth Vader, Foley had to tap into something deep within himself as well to portray the twisted and sadistic individual that was the original iteration of Mankind. Glam was huge in the music scene of the eighties. Bright, colorful clothing with vibrant, high energy party anthems. Sting was also bright, colorful and full of energy. 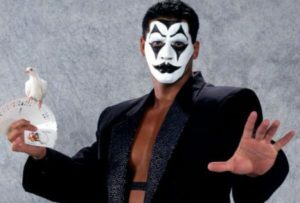 Hailing from Venice Beach, California and sporting neon colors on his face paint and tights, he quickly became the hugely popular franchise of WCW. 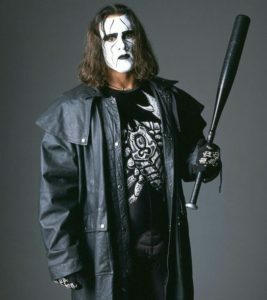 By the mid nineties though, grunge and heavier music was the hotness, and when Scott “Razor Ramon” Hall told Sting to check out the movie The Crow as inspiration for a character change, the Stinger took it and ran all the way to the bank with it. “Crow” Sting has stuck around for much longer than his original “Surfer” Sting character, and despite some tweaks and adjustments to the overall appearance along the way, this version of Sting is still more popular than ever 20 years later. The idea of an old west undertaker in wrestling may seem like a ridiculous idea that could never succeed, but hell it is pro wrestling. In the hands of anyone else the character likely would have been made to rest in peace in short order. Mark Callaway however saw the potential and dedicated himself to the character, always adding to and refining it, and much like Jason Voorhees, Undertaker began as a hulking mass of humanity that was impervious to pain before metamorphizing into an unstoppable, undead zombie. And, while Undertaker has been buried alive, had a casket set on fire while he was supposedly inside of it, and had to fight his doppelganger, he’s thankfully never been sent to outer space. Hailing from the great white north of Canada, the land of poutine, hockey and unlimited apologies. Jonathan however does not apologize for his lifelong fandoms. A fan of pop and nerd culture from the 70's, 80's and 90's, whether it's the well known or the niche, Jonathan usually has something to say. In his free time, he can be found watching a wide variety of film and television or blasting punk rock and heavy metal.